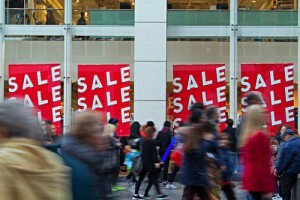 Black Friday has some of the highest retail crime statistics. When there are a lot of customers there are plenty of distractions for those in charge. Would-be thieves can hope to get away with their crimes much more easily. Shoplifting is a big concern and a major liability if theft goes unnoticed. With highly trained security guards in place, an extra set of eyes will be on your merchandise and customers. Shoplifters will have a much harder time getting away with their loot. On the biggest shopping day of the year, some people get angry with each other for simply being in the same place at the same time, taking up space. Customer violence can easily erupt, particularly over a coveted item or one that is low in stock. Even when people are being courteous with one another, there is an increased likelihood of tripping, falling, and accidental injuries simply because of the high numbers of people in one space. Crowd control is essential, especially on Black Friday. Security guards are in place to minimize risks and stop injuries before they happen. Whether your business is located in a mall, strip mall, or otherwise, parking lots are heaving on Black Friday. Shoppers who are rushing to take advantage of a great deal, people fighting over parking spots, no parking spots to be had at all – any of these situations can lead to fights, car accidents, and even road rage. Security guards can monitor the access into and out of lots, block parking areas that are full, and intervene before a problem occurs or escalates. Most people have seen a movie or television show where a crowd is so heavy it knocks down doors stampeding to get into a store. This may not be an accurate representation of reality, but it’s not far off. There are plenty of opportunities for the premises of a store and its merchandise to be damaged because of crowds, impatient people, and jostling for items or a place in line. Stanchions and clearly marked areas should be enough to keep shoppers in check, but that’s wishful thinking on a frantic Black Friday. Uniformed security guards are needed to protect all your assets amid aggressive and determined shoppers. Increasing your on-site security for Black Friday is critical for this shopping holiday to be a profitable success. You want to provide your customers with the options and merchandise they expect, and you want to keep them, your employees, your merchandise, and your store safe in the process. Choose Korner Security to provide comprehensive Black Friday security solutions that are customized to your needs. Chaos is inevitable on Black Friday, but you can keep it in check with temporary security guards. Call us today for help with your security needs during the holiday season.